Bastille Day comes to Smith Street, Harlem gets its own Flea, and: World’s Largest Lemonade Stand! Bastille Day pétanque in Cobble Hill. UPTOWN FLEA: Brooklyn has the Fort Greene Flea and the DUMBO Flea – and nw, Harlem strikes back. Expect about 60 vendors to kick off the all-new Harlem Flea Market, opening Saturday at 123rd Street and Morningside Avenue. 10AM-5PM. HOOKED: More than 800 new artworks in every medium will be on display at the Brooklyn Waterfront Arts Coalition’s summer show through August 16. Stroll the goods in Red Hook at the opening reception on Saturday and enjoy music from the jug-bandy Blue Vipersof Brooklyn. 3PM. ADE & ABET: There’ll be a smorgasbord of fun at the Target High Line Street Festival on Gansevoort Street – body painting! inflatable sculptures! Mciahel Arenella’s Dreamland Orchestra! – but we’re hands-down most excited about the World’s Largest Lemonade Stand. Yep. Sunday, 12-5PM. UNDERAGE SHOW: They Might Be Giants are all about the kids now, did you hear? They’ll entertain wee ones (and their parents, of course) with material from their recent children’s releases at the Prospect Park Bandshell, Saturday, 4PM. TRICOLORE: Cobble Hill’s Smith Street turns into a Provencal village for its annual Bastille Day event. 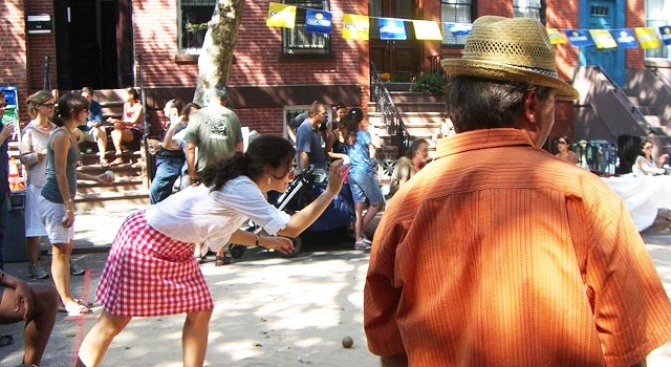 80 teams face off in pétanque as you sip Ricard and eat cornichons under the trees. Vive! Sunday, 12-10PM.